In this handout photo provided by the Charleston County Detention Center, Officer Michael Slager poses for his mug shot after being arrested on a charge of murder April 7, 2015, in North Charleston, S.C. 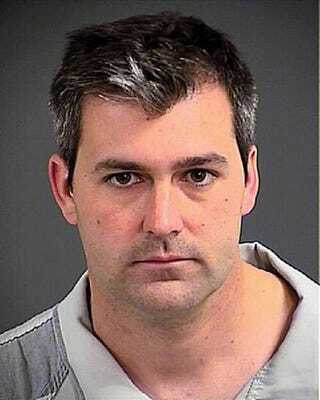 The judge in the murder trial of a white former North Charleston, S.C., police officer charged with shooting and killing an unarmed black motorist denied two defense motions Friday concerning cellphone video of the shooting. Michael Slager, 34, is charged with the April 2015 shooting death of Walter Scott, 50, who was running from a traffic stop in North Charleston when Slager shot him in the back and killed him. The second day of testimony featured three witnesses, including the man who filmed the shooting on his cellphone, Feiden Santana, the Charleston Post and Courier reports. Santana, whose cellphone video led to Slager’s arrest, was the first prosecution witness to take the stand Friday. The defense presented two motions to the judge, one that would have prevented the state from showing Santana’s video altogether and one that would have prevented it from being shown in slow motion. Judge Clifton Newman denied both motions. Santana, 25, testified that he was walking to his job as a barber when he saw a black man run by him with a white police officer chasing after him. He followed them to an open lot and began recording on his cellphone as they scuffled on the ground. Santana said that he heard “an electric sound” as the two scuffled. That sound was later identified as a Taser. Santana testified that he was shocked at what he saw, so he took out his cellphone to record. According to the Post and Courier, Santana said that he was reluctant to let the authorities know that he had taken a video of the last moments of Scott’s life. “I didn’t want to be involved, but at the same time my moral [sic] and my value didn’t allow me to do that because it was an injustice that I saw,” Santana said. Santana said that when additional officers arrived on the scene, he told them that he had witnessed what happened, but he left before he could be interviewed. He said that at the time, he thought Scott was still alive. The second prosecution witness was Tawayne Weems, an assistant principal at Stall High School in North Charleston, who was called as a corroborating witness to Santana’s testimony. The third and final witness for the day was Clarence Habersham, who was the first officer on the scene after Slager shot Scott. Habersham testified that he rendered first aid to Scott, and another officer attempted CPR. Read more at the Charleston Post and Courier.